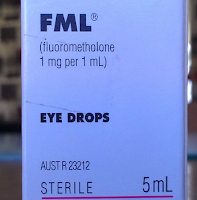 FML eye drops is a widely used eye drop with fluorometholone as the main ingredient, which is a type of corticosteroid (or steroid). Corticosteroids are usually used for reducing inflammation. Its mostly prescribed for a short-term use after eye surgery. FML eye drops reduces the itching, irritation, pain and redness in eyes. Never take this eye drop if your doctor have not prescribed it to you. As its a corticosteroid, so prolonged usage of this medicine can cause some side effects. One more ingredient of FML eye drops is polyvinyl alcohol, which acts as lubricant for dry and inflamed eye. Its important to follow the dosage instruction given by your doctor. As FMl eye drops are usually prescribed after an eye surgery so its more important to follow the advice and dosage told by the doctor. In most cases its prescribed to put 1 to 2 drops of FML eye drop in the affected eye every hour for 1 or 2 days. After that the frequency of dose is decreased gradually to just 2 to 4 times in a day. This eye drop is never prescribed for more than a week due to the side effects associated with it. The side effects listed are not seen in every patient using this eye drop. Only a few users of FML Eye drop complain one or two side effects listed here. If you feel any one of them then consult your doctor. FML Eye Drops can damage your contact lens, so its better to remove contact lens before using this eye drop and then wear it after 15 minutes. Never touch the tip of dropper, else can cause infection in your eye passing the germs through the drops. Don't drive or operate any machine just after using FML Eye drops as it can blur your vision for some time. This eye drop is never prescribed for children under 2 years. Always keep this medicine out of reach of children. FML Eye Drop (5ml) witha concentration of 1mg/ml costs $8 to $10 . Prices may differ with country, currency and brand.